Wonderful vintage, with an exceptional maturity slow and regular during all his cycle. 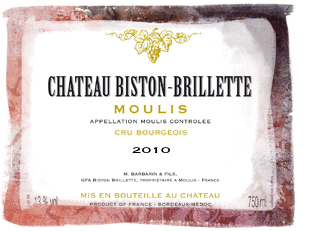 Decidedly the vintage of the decade at Biston-Brillette ! Nice smell developing aromas of black fruit, smoky and spicy touches, palate well balanced, fleshy, fruity with good length, beautiful freshness and potential. Deep crimson. Elegant nose of fresh fruits layered over subtle spicy oak. The palate is harmonious, melted and driven by fruit and spice on entry. The mid-palate and finish are firmer and intimate a certain cellaring potential. Fleshy palate, dense, but well-balanced with delicate finish. Good classical style for this sure value of the appellation. Another superb over-achiever from the appellation of Moulis in the Médoc, this wine shows lots of licorice, barbecue smoke, charcuterie, plum end black currants. It hits the palate with medium to full-bodied opulence. The tannins are sweet and the acidity adequate to provide definition and vibrancy. This is a beauty. Fresh, Cabernet-dominated black fruits nose with touches of leather showing some evolution. Charming palate of summer fruits compote and creamy finish. 2013-2022. Saftig und fruchtig, gut eingebundenes Holz, mittellang, geschmeidiges, kaum alkoholisches Finale; zuverlässig. 2018 bis 2026. Pink, raspberry, round palate, supple, mellow, delicate, lovely silky tannins, looks like a Margaux.